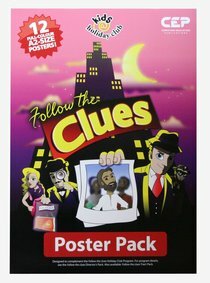 About "Follow the Clues (Poster Pack) (Kids @ Club Series)"
Suitable for a single teacher or small team, Kids Club resources from Christian Education Publications are ideal for churches, camping ministries, holiday clubs, or lunchtime groups. From experienced children's ministry advisor and singer-songwriter Tony Jones, comes this exciting new look pack with loads of fun activities, games and music for children in years K-6. Bonus CD-Rom with photocopiables, outreach resources, PowerPoint slides and clipart. - Publisher. Help solve the mystery of the man who defeated death with this fun, action-packed Holiday Club program. As they uncover God's promises throughout the Bible, children aged five to 12 assist the forensic team led by Detective Duck and Constable Clooney as they follow the clues to Jesus - the man who defeated death! The Director's Pack includes the full program for five half-days of fun and learning; a DVD with two short animations and a CD-ROM jam-packed with music, PowerPoint presentations and printable support materials. A programs for primary aged kids asking questions at church, club or school. A seven-session program that explores some of the hard questions kids ask about God. Suggestions for music, craft, cooking and games are included plus a Powerpoint presentation of two tracts for kids (which are also included). - Publisher. This Australian produced resource has over 100 spiral-bound pages of ideas for kids ministry. The core is 7 teaching segments all about the meaning of faith, each with content outlines, visual aids, and fun activities. In addition there are 11 songs to learn, 4 recipes, 10 extra craft ideas, and 22 games - from big and active to quiet brainteasers. Also included is a CD-ROM with music for the 11 songs, plus Powerpoint and Graphics files.